The diagram shows a semicircle ABC with centre O and radius 8 cm. Angle radians. i. In the case where , calculate the area of the sector BOC. ii. Find the value of for which the perimeter of sector AOB is one half of the perimeter of sector BOC. iii. 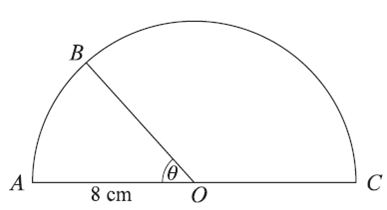 In the case where , show that the exact length of the perimeter of triangle ABC is cm. In the given case, angle made by the sector is .